The woman came from a magazine picture. Something happened when I scattered some of my collection of car & van cutouts around on the paper beside her. What is the piece about? Congestion? Pollution? 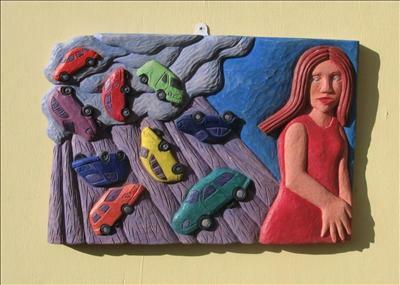 Or maybe a bit like 'raining cats & dogs' but with motor vehicles!